Indian cricket team gave a dismissal performance in the first One Day International of the series played against Sri Lanka but Indian fans haven’t lost hope and are expecting a comeback from the Indian team in the second ODI. The only Indian player who stood firmly against the Sri Lankan attack was former skipper and wicketkeeper-batsman MS Dhoni who scored 65 runs of 87 balls and his innings included 10 fours and 2 sixes. Dhoni is one of the fittest cricketers of the present era and we can prove this statement with a video which has been shared by BCCI on Twitter. 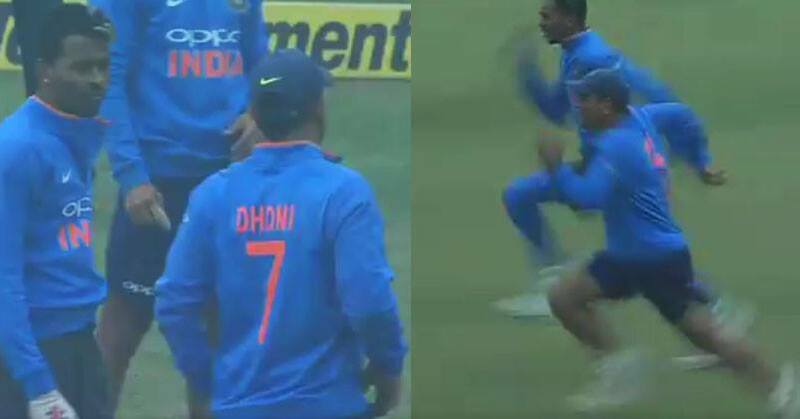 In this video, Dhoni can be seen having a 100 metre dash with Hardik Pandya who is 12 years younger to him. Dhoni is 36 years old while Pandya is 24 years old, so if we ask you about the winner of 100 metre race competition, you will think that Pandya must have won it as he is younger and must be faster and fitter than Dhoni. No player aged 36would’ve thought of a dash with a 23 young lad. Esp a keeper with a bowler. MSD is stunning. Age is just a number. Dhoni is number one always, isn’t he?